To listen to a podcast review of this film, click here, or subscribe to Bina007 Movie Reviews in iTunes. I laughed at almost every line of ALAN PARTRIDGE: ALPHA PAPA. And I don't mean an inward knowing intellectual laugh but proper laugh-out-loud, can't eat my jelly babies laughing. And so was everyone else in the cinema, which was a bit disconcerting because they had an average age of twenty which means they weren't even born when Steve Coogan's comic creation first hit the small screen. I felt momentarily old and passed it, and in between cackling with laughter at Patridge lip synching to Roachford's late 80s hit "Cuddly Toy", I thought of LCD Soundsystem's "Losing My Edge" - all those teenagers "in little jackets and borrowed nostalgia for the unremembered eighties". There was some irony in seeing these "yoot" get down with Alan Partridge - a movie that is at heart about people who are losing their edge, whose faces don't fit with shiny new brands aimed at the target demographic. People who want to stick two fingers up to the airbrushed over-familiar breakfast DJs who play from carefully manicured set-lists and have about as much to do with real music as IPL has to do with real cricket. But, anyways, back to the matter at hand! 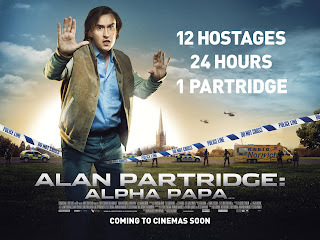 ALAN PARTRIDGE: ALPHA PAPA is absolutely brilliant, and not just if you're a fan of his TV appearances as talk-show host and then his ignominious descent into local radio. We've got Alan as we love him - his goofy geeky fashion faux pas - his borderline sexism and racism - his sly selfish survival instinct - and most of all, his egomania. There's something despairing and tragic about Alan, and yet, he always comes out on top, and that's why we love him. We all have moments of pathetic desperation and Alan speaks to that. In his first feature film, Alan is a DJ at North Norfolk Digital - basically a media no-man's land. But he gets, and ceases his chance at fame, when his fellow DJ Pat Farrell is sacked by the station's new greed capitalist owners. And when I say sacked, I mean shafted by a devious Alan. Farrell goes FALLING DOWN, and starts shooting up the station, resulting in a hostage crisis that Alan mediates. What results in a script that is absolutely packed with jokes but which also hangs together in terms of the emotional motivation of the key characters and feels satisfying and meaty rather than just another shameless cash-in TV adaptation that has some funny scenes but no real substance. God bless Armando Iannucci. For giving us Alan and Malcolm Tucker. That man shouldn't just be an OBE, he should be a bloody Duke, or Lord or something that signifies what a genius he is. 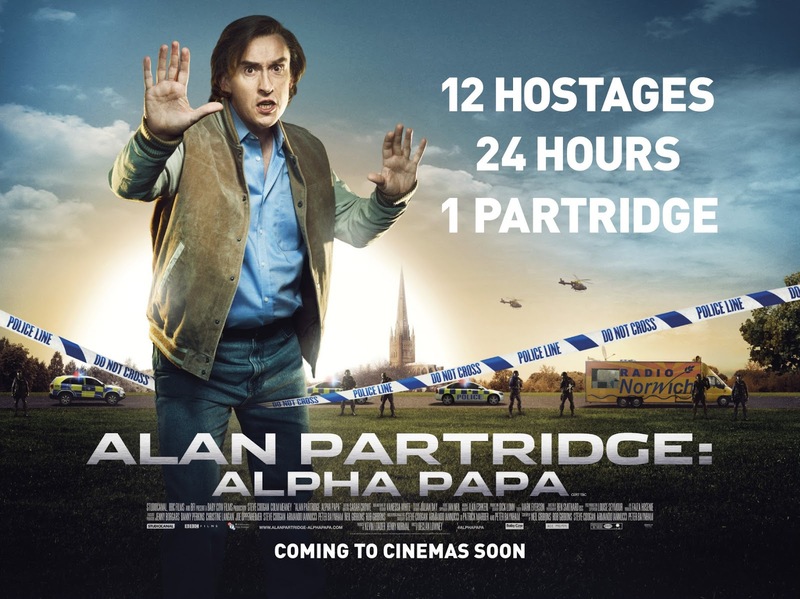 ALAN PARTRIDGE: ALPHA PAPA has a running time of 90 minutes and is rated 15. ALPHA PAPA premiered in Norwich on July 24th and was released in the UK on August 7th. It opens in New Zealand on December 5th.